Born in Havana, Cuba, Carlos Molina is lauded as founder of the Cuban School of Guitar, one of the most distinguished instrumental schools. He began his performing career in 1969, after graduating with a degree in Guitar Performance from the National Conservatory in Cuba, concurrent with a Law degree from the School of Law at the University of Havana. He finished his music studies at the Superior School of Music, known today as ISA, Instituto Superior de Arte. In 1970 he won First Prize at the National Guitar Competition in Cuba, and his first tour of Europe followed. He has been soloist with symphonic orchestras, including the National Symphony of Cuba, Sinfónica de Oriente, Sinfónica de las Villas, Marianske Lazne Symphony, Miami Beach Symphony, Miami Chamber Symphony, Florida Lakes Symphony, etc. Molina has shared concerts with Alirio Díaz, Leo Brouwer, Turibio Santos, Benjamin Verdery, Carlos Barbosa-Lima, Nikita Koshkin, and toured worldwide as solo guitarist of principal ballerina Alicia Alonso and the Cuban National Ballet. In 2009, Carlos Molina was honored with the Order Maestro Alirio Díaz, the highest guitar award in Venezuela, and in 2007 with a Lifetime Award: Premio Chitaristico Citta di Fiuggi, in Italy, together with Alirio Díaz, Leo Brouwer, and Carlos Carfagna. Molina has been featured in 56 international guitar festivals, and since 2001 has been performing with his wife, soprano Marisa Molina, as a duo. 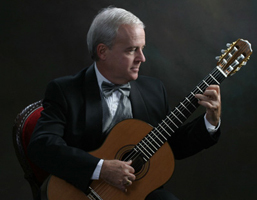 Parallel to his concert career, Molina gives master classes and has juried 36 international guitar competitions; including seven times at the Guitar Foundation of America (GFA). A tireless promoter of the instrument, Molina has directed and produced nine guitar festivals, starting with the First Guitar Festival of Cuba in 1976, Panorama de la Guitarra, and the First International Guitar Festival of Cuba in 1978, Encuentro de Guitarristas de América Latina y el Caribe. In 1987, Molina founded the Miami Classical Guitar Society. In 1991 and 2002, Molina was selected to direct and produce the GFA’s International Convention and Competition in Miami. In 2004, Molina created Miami’s First International Guitar Competition, through the Miami Classical Guitar Society. Carlos Molina has been dedicatee of many works, including the Canticum by Cuban composer Leo Brouwer in 1968, the duo Return of the Winds by Russian composer Nikita Koshkin in 2002, as well as works by Olivier Chassain, Gerard Drozd, Roberto Fabbri, Jon Nelson, Orlando García, Carlos Rafael Rivera, Antonino Hernández Lisazo, Armando Rodríguez, Teresa Madiedo and Molina’s brother, Luis Manuel Molina, amongst others. Molina began teaching at the National Conservatory of Havana, Cuba in 1969. In 1976, he helped create the guitar department at the University of Havana’s Superior Institute of the Arts, and became Chairman two years later. In the U.S., Molina has been faculty of Miami-Dade College for 30 years; and in 1987, he initiated the guitar program at Florida International University, where he taught for eleven years. Throughout his career, Molina also directed, written, and produced TV and Radio programs, published numerous articles about the guitar, and presented over 70 lectures about the guitar worldwide. Molina is featured in Cuban Music from A to Z by Helio Orovio (Duke University, 2004); Diccionario de la Música Española e Hispanoamericana, (Madrid, 2000); Leo Brouwer by Isabelle Hernandez (Bogota Colombia, 2000); Antonio Lauro by Alejandro Bruzual (Caracas, 2000); Encuentro de la Cultura Cubana, Musica by Cristobal Diaz Alaya (Madrid 1999/2000); Diccionario de la Música Cubana by Helio Orovio (Colombia, 1993); Música Cubana, by Cristobal Diaz Ayala (Puerto Rico 1981); and Gitarren Lexikon, by Josef Powrozniak (Poland 1976). In 1996, Board of County Commissioners of Miami-Dade declared the 31st of May as: Day of Maestro Carlos Molina.